Christopher Elvidge with the U.S. National Oceanic and Atmospheric Administration (NOAA)’s Earth Observation Group writes about matching night-time imagery with monitoring data from fishing vessels to shed new light on the ‘dark’ fleet. In Indonesia, VMS is required on boats over 30 gross tonnes, which represent approximately 10% of the domestic fishing fleet. In the USA, VMS is required on fishing boats longer than 19 meters and, in certain federal waters, all fishing boats are required to carry VMS. In other countries, such as the Philippines, there is currently no VMS requirement. The World Maritime Organization (WMO) requires that all boats 300 gross tons and larger carry AIS. Thus, there are vast numbers of fishing boats under these size limits that lack track reporting. The second shortcoming is that vessel operators are able to evade detection by disabling their AIS or VMS devices, reporting a false identification, or reporting a series of false locations. Because of the large numbers of fishing boats that carry no automatic location broadcasting and the possibility for AIS / VMS tampering, there is a need for other, complimentary detection sources. Certain satellite remote sensing systems can detect vessels and could be used to track compliance with fishery closures. High spatial resolution optical sensors are able to detect and characterize vessels und low cloud daytime conditions. Satellite synthetic aperture radar (SAR) systems are also able to detect offshore vessels and have the advantage of all-weather operations. The downside for these sources are that it may take several days to access the data, there are generally fees associated with the data access and global coverage is not currently available on a daily basis. Data from meteorological satellite sensors have the favorable characteristics of providing global coverage, data are generally open access and are available in near real time. In addition, there are long term archives for meteorological satellite data, which can be used to develop extended temporal records. The major disadvantage of meteorological satellite data is the spatial resolution, which is typically far too coarse for the detection of vessels using normal spectral bands. The exception to this is the detection of electric lighting on boats at night. It has been known since the 1970’s that lights from fishing boats can be detected with low light imaging data collected at night by sensors flown on satellites. The low light imaging on these sensors is designed for the detection of moonlit clouds in the visible, but also enables the detection of electric lights present at the Earth’s surface. One of the lighting sources detected are fishing boats that deploy lights to attract catch. This capability was first described in the 1970’s for data collected by the U.S. Air Force Defense Meteorological Satellite Program (DMSP) Operational Linescan System (OLS). More recently, boat detection has been demonstrated using low light imaging data collected by the NASA/NOAA Visible Infrared Imaging Radiometer Suite (VIIRS). As part of NOAA’s research to determine which types of fishing boats are detected by VIIRS in Indonesia, we have developed algorithms to cross match VMS tracks with VIIRS boat detections. Thirty-three months of Indonesia VMS data were provided by Global Fishing Watch. The matching process involves using an orbital model and GPS track to predict the probable location of each VMS boat at the time of the VIIRS data collection. A match is tallied when a VIIRS boat detection falls within one km of the predicted location. The overall match rate came out to 16% – most likely meaning that 84% of the VIIRS boat detections came from vessels lacking VMS. 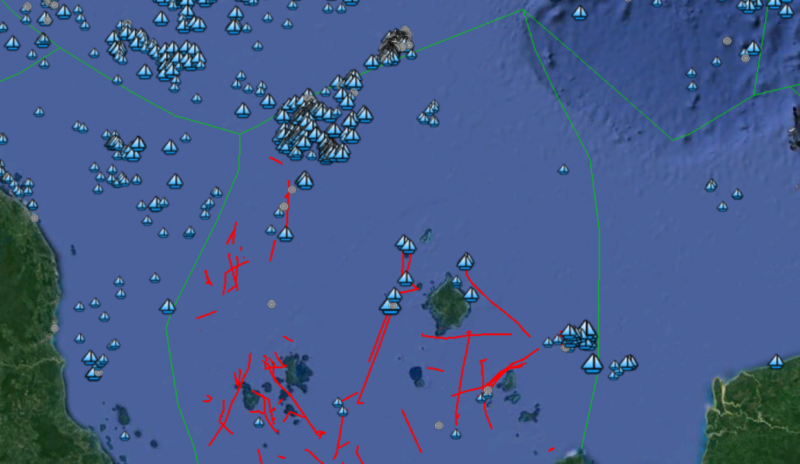 The algorithm has been successfully tested with AIS tracks supplied by Global Fishing Watch. 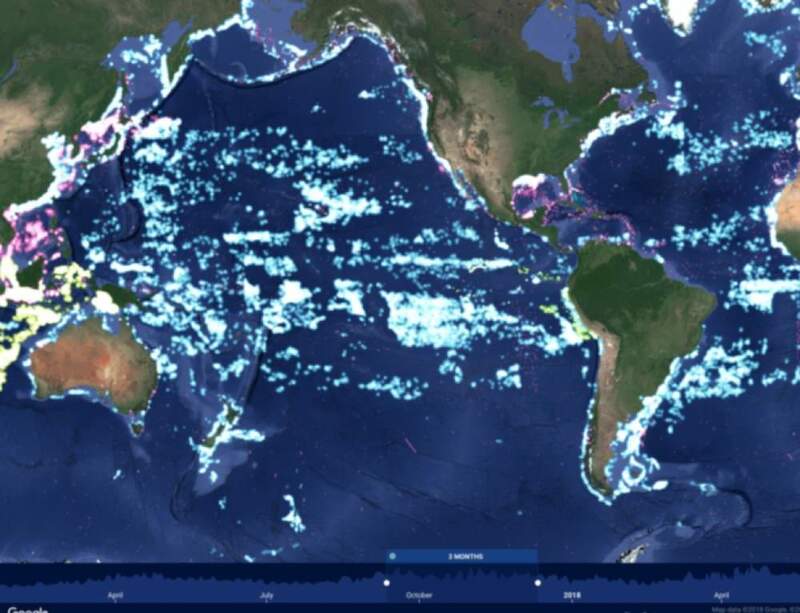 The vast numbers of VIIRS boat detections that lack VMS or AIS points to the value of VIIRS data for comprehensive monitoring of fishing boat activity. While VIIRS only detects heavily lit boats, lights are widely used to attract catch throughout Asia and in a number of other fishing grounds around the world. The ability to cross match VIIRS with VMS and AIS tracks opens up the possibility of detecting potentially illegal “dark vessels” in high sea fishing grounds where every boat may be reasonably expected to have AIS or VMS.